Some are petitioning Congress to eliminate the Special Rule for Model Aircraft – also known as Section 336. Section 336 has allowed AMA to manage its members and fly safely and responsibly for over 82 years. Without Section 336, members would be required to take a 60 question FAA exam in person, pay for an FAA remote pilot license, and face other unnecessary restrictions. The organization says that losing the Special Rule would be a devastating blow to the model aircraft hobby. 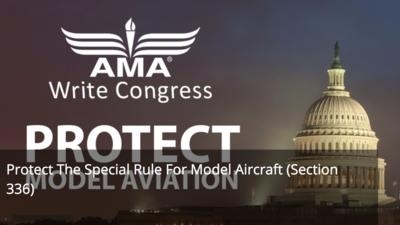 In a message released to the media, the AMA said "This is a critical moment to let your elected representatives know the importance of the Special Rule for Model Aircraft and the role of community-based organizations such as AMA. "Our community has operated safely for decades. Model aviation has played a critical role in the innovations of new technology and encouraging young people to pursue an interest in science and technology fields. More than that, this long-standing hobby has been passed down from generation to generation and is a tradition for many American families. The AMA has created a website that allows its members and other interested parties to write to legislators that includes new features to make spread its message. "Be sure to utilize the social media links that write to your legislators. After hitting submit, we provide tools to help you call your legislator. Phone calls and social media posts are becoming more influential than emails," the organization said in the release.